For other uses, see Miltiades (disambiguation). 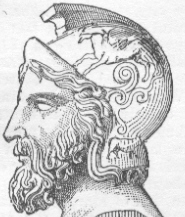 Miltiades or Miltiadis (Greek: Μιλτιάδης, short: Miltos) is a Greek masculine given name. The name is derived from the Greek word for "red earth". ^ "Miltiades". Behind the Name. Retrieved 11 August 2012. This page was last edited on 12 July 2018, at 07:23 (UTC).